All Sunseeker yachts for sale worldwide are listed below, scroll down to view them. In 1969, at a time where there were no significant builders of boats for sports and leisure in the United Kingdom, Robert Braithwaite (later to be named Ernst & Young’s UK Entrepreneur of the Year in 2002) grabbed the opportunity to acquire Owens Cruisers’ boat molds and thus, began his journey as a boat builder. The first craft to launch was the Sovereign 17 followed by the Sovereign 20 in 1971. A major turn-point came about when the Formula One driver, Henry Taylor, required a full-width sunbed accommodated to his boat; hence, the design and launching of the sports cruiser Sports 23 and Daycab23. Sunseeker’s first true performance model was the Offshore 28, gaining sales in the Mediterranean market. By the mid-eighties, their focus shifted from overnight accommodation boats to larger cockpits, two cabin high-performance boats: the Portofino31 and the Tomahawk 37. In the early 90’s, Sunseeker’s first production boat with twin jet drives was launched, the Renegade 60, followed by the Predator 80. The millennium saw the launch of the 105 yacht, made with advanced composite materials and winning two of the world’s most prestigious accolades in the International Superyacht Design awards. In 2015, the delivery of Sunseeker’s 100th luxury performance motoryacht in the 100ft+ category was accomplished with Sunseeker’s flagship 155Yacht. 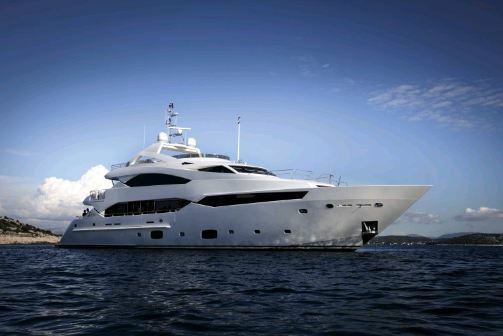 No doubt that through the years Sunseeker has seen some difficult times and a couple of “hand changings” in the ownership of the company, and in 2013 the Chinese conglomerate Dalian Wanda Group acquired 91.8% stake in Sunseeker. Dalian Wanda Group is engaged in three key business activities – commercial properties, culture, and finance. Wanda Commercial Properties is the world’s largest real estate enterprise and the biggest five-star hotel owner in the world. Wanda Cultural Industry Group, meanwhile, is the largest cultural enterprise in China, and the world’s largest cinema operator. It is also the world’s biggest sports company and the largest internet finance enterprise in China.